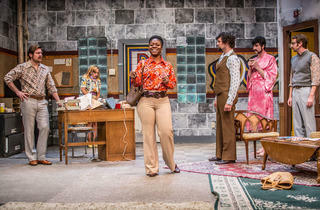 The Inconvenience and the New Colony recreate a 1970s sitcom vibe. The New Colony and the Inconvenience are equally known for delivering off-kilter concepts that work. 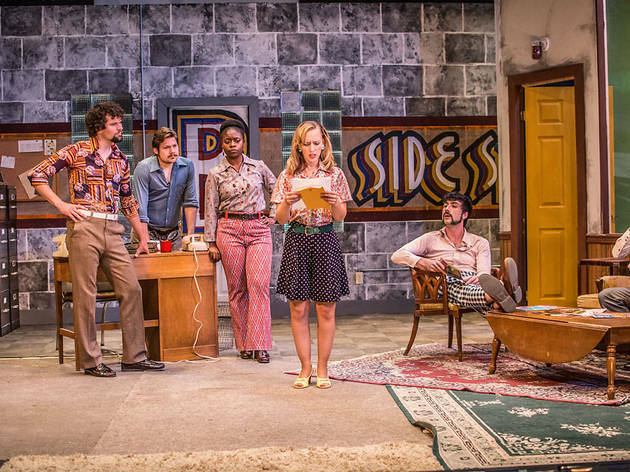 Their collaboration at the University of Chicago’s summer residency program has produced something so smart, and so glaringly obvious, that you’ll wonder why no one tried it before. 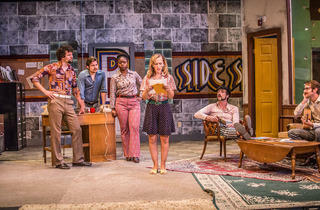 It’s called B-Side Studio, and it’s not a play—it’s a sitcom. Let’s back up for a moment here. 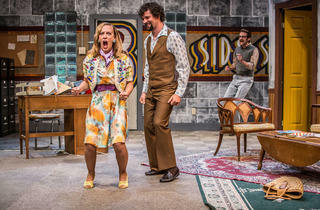 The two companies have written four “episodes” for the stage of a classic ’70s-style sitcom, albeit with modern humor. B-Side is a mediocre recording studio run by the McNamara brothers with help from their eccentric staff. They’re down to their last dollar, dime-bag and Dewar’s, but the plucky crew is determined to salvage the bitter remnants of all their hopes and dreams. The performances are filmed, and if you happen to attend episodes two, three or four, you will find the previous ones online so you can get caught up on the action. And you, the theatergoer, provide the laugh-track and live studio audience. If that concept sounds byzantine and intimidating—it isn’t. 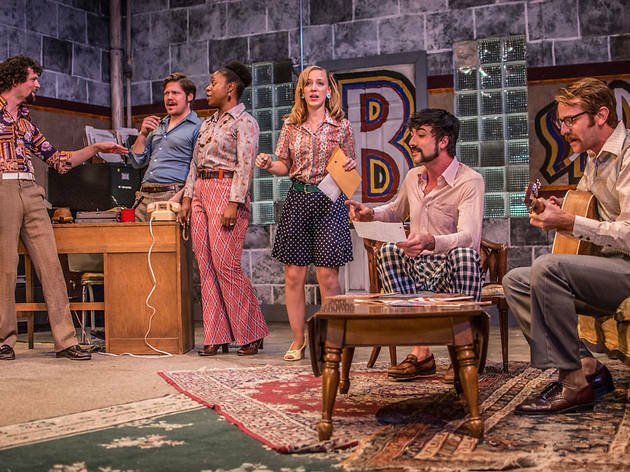 This triumphant mash-up of mediums, genres, and styles works because its goal is simple: bring the experience of old-school, multicamera humor to live performance. We know this format in our bones; there’s a strangeness and joy in seeing it replicated on stage. 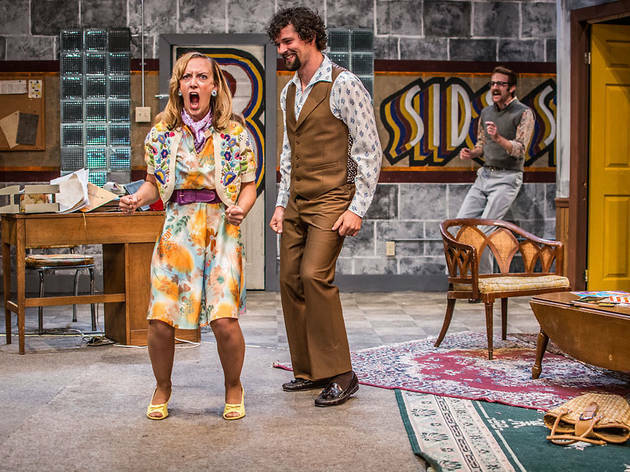 B-Side Studio captures the rhythm of sitcom dialogue, the color of the costumes, and that particular mixture of sincerity and sarcasm. Every element is present, from an applause sign to a stand-up comedian who warms up the audience in the preshow. 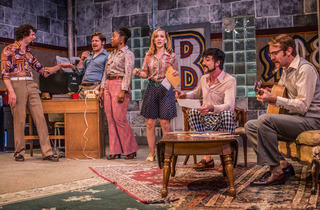 The cast is in top-notch harmony; to single out any one performance would do a disservice to what they are together. 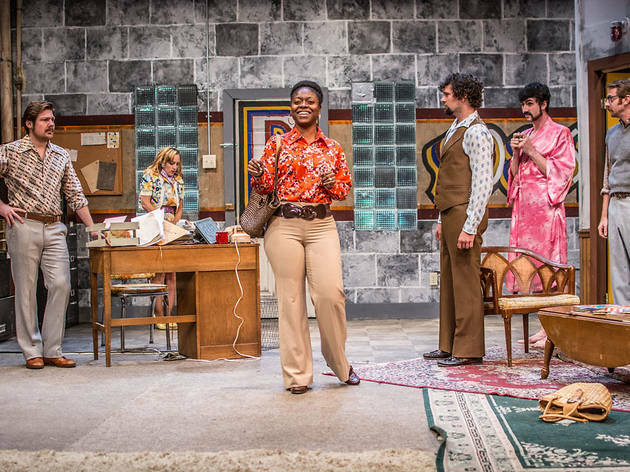 The piece comfortably takes advantage of the time period without being ruled by it, and it has its fun with race relations, independent women, and national tragedies. A peppering of self-awareness and meta comedy make the absurdity of the style just another part of the entertainment. Television plots are disposable and don’t need resolution, which is why the first episode of B-Side Studio doesn’t conclude so much as end. It’s slightly abrupt. I didn’t care—I just wanted more. Watch the pilot episode of B-Side Studio on YouTube.